The Beauford Open is designed to look like a vintage car. At the front is a long bonnet with flowing wings at either side to give the appearance of a 1930s Style Grand Tourer luxury car. There car is a 4 door version and come in both open and closed bodies. 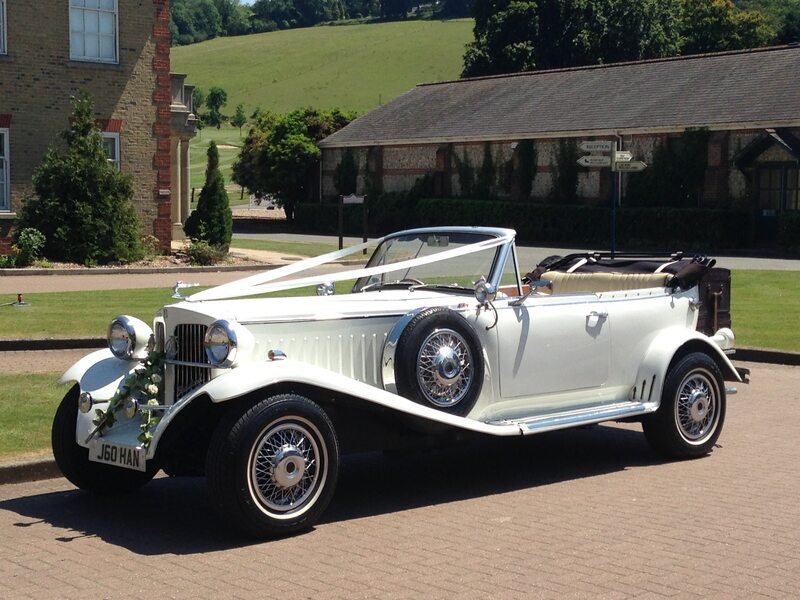 With detachable soft top roof finished in stunning old english white with contrasting full cream trim and red piping interior and a black Convertible soft top hood can be raised or lowered for your preference and the weather on your wedding day your Beauford wedding car will come dress with ribbons and bows on the exterior of your choice the stunning look of the vintage 1930s wedding car is a perfect choice for the bride on her wedding day. For those of you who love luxury cars, we have the Bentley Continental Flying Spur which is a four-door version of the GT with full size rear seats. As with all Bentleys the Flying Spur has meticulous craftsmanship and every surface is covered by leather and rich wood trim. Also, with all Bentleys the Flying Spur provides outstanding performance which is provided by a massive 12 cylinder engine and for the size the handling is brilliant.